I'm happy to see Uzog come back mostly as he was. I feel he's a great addition to the Durgeth faction, I just didn't feel comfortable with his low price before. 110 Points for Uzog is much more in line with how he felt during my testing him. Since I didn't have other concerns with him I'm more than happy to vote to review Uzog. To me the Mission of SoV is to induct units that have zero impact on the Power Curve of Heroscape. Because of this, it would be unlikely that an A ranked unit would ever arise from this process. at 85 points Uzog seemed to be out classing other units. At 110 Uzog seems to be a reasonable stand alone hero, and perhaps even that elusive A ranked unit depending on where the Ravagers fall. I vote YEA to review Uzog at the new price point. Uzog has received 4 Yea votes to review (Scytale, BiggaBullfrog, wriggz, and Ixe) and moves forward in the process. That is some seriously cool combining of theme and mechanics. Johann Graybeard has passed United Fanscape Review and moves forward in the process. In my review of the prior version of Uzog, I liked almost everything about him, but was uncomfortable with the low price. 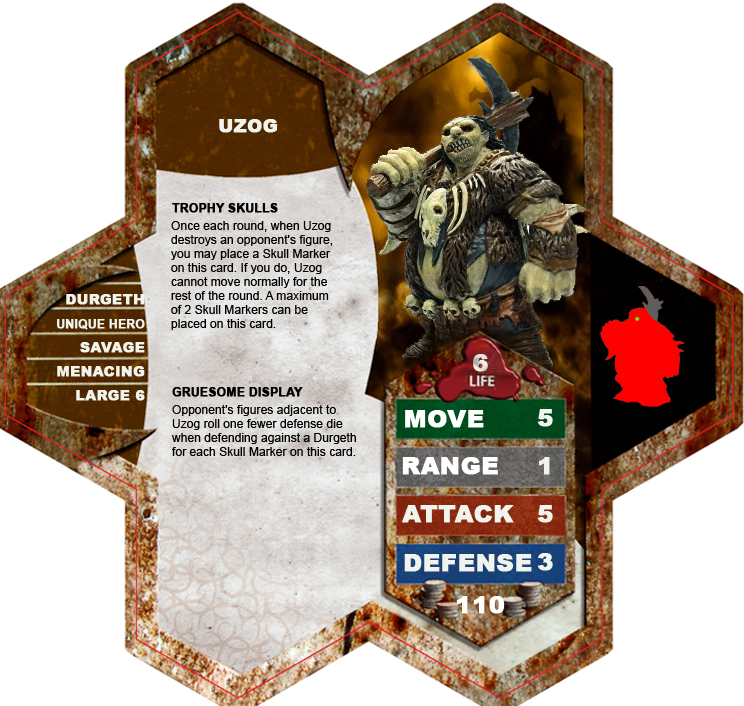 Uzog at 85 points won't break the metagame as the Durgeth Ravagers are too swingy to be a top-class tournament army, but with all the testing I did I could never shake the uncomfortable feeling that the unit's price did not reflect its value. The bulky guy isn't an army by himself, but he provides a lot for his Durgeth brethren. 110 points is exactly the price I would have valued Uzog at myself, so I'm very happy with this change. I vote Yea to induct Uzog into the SoV. I am personally a fan of the Beakface Sneaks design, and I'm happy to see the Raptorian faction expanded, especially with fitting miniatures. Let's see if the design holds up. The recently-released Notingham Brigand is an apt comparison point. The bird has a little more speed, a little less range, less attack, and more defense, but all pretty close. The Beakface Archer is notably cheaper, however. While that may seem like a red flag, the difference in offensive power is significant. Attack 3 at Range 7 carries quite a bit more punch than Attack 2 at Range 6. The Brigand works with a broader variety of units as well, and Disengage is better than Glide. So the price is reasonable. A better question is how does it compare to the Beakface Sneaks. If a pair of Archers is much better than a unit of Sneaks (and Range is great in general), then the faction has a problem. It's hard to determine by Theoryscape, though, so I'll leave that up to the Playability section. The Beakface Sneaks set a clear precedent for (at least one subspecies of) Raptorians, and the Archer slips into that faction nicely. Glide is practically necessary and Improved Flocking is a nice upgrade for a Hero over a Squad. Low stats and a low cost fit in nicely too. The miniature, while a little smaller than the Sneaks, fits in pretty well with them. The main creative point here is the reworking of Flocking to make it more useful for a weak solo archer. Combining a self-and-others bonding mechanism with the movement boost from Flocking is a good concept, and I appreciate the restraint of not adding further complexity to the unit with another power (Glide hardly counts). As a solo hero, the Archer plays exactly how you'd expect. Not much to say there, other than there are more potent filler options for the point total. The real question is the value of Improved Flocking, and how that relates to the existing Raptorian units. My initial concern was that a horde of Archers would simply outclass the Beakface Sneaks, especially with some Beakface Rogues mixed in. In my experience, that just doesn't happen. A flock of Archers can play similarly to a bunch of Nottingham Brigands, with a bit of extra board control in the beginning of the game before attacks begin. The problem is that they are a lot less effective than the Brigands. Two attacks of two just isn't much, even if their speed and range can usually get them height. It's just not a lot of offensive punch. Combine that with the fact that neither the Sneaks nor the Rogues make good screening units, and they come off as second-class to the Brigands. (Though if solid Raptorian screening units come along, that may change, though they will still suffer poor offensive output.) Mixing in some Rogues can add some punch, but only in certain situations, and even then you're only hoping the Archer can do something with his little bow. Beakface Archers are great for early game setup. The Sneaks suffer from the attack restriction on Flocking in the beginning of the game, while Improved Flocking gets around that nicely. If the opponent brings the heat unexpectedly fast, it's easy to adapt because Improved Flocking can give full turns to Raptorian Heroes, including the Warwitch. After that, though, the Archers alone don't have the firepower or defenses to take on armies by themselves. I found the extra power of the Sneaks, even as small as that is, to be preferable once things got going, especially when going up against enemy ranged units. Of course, it was always nice to have some Archers to fall back on once Sneaks became scarce. Archers also make nice escorts for the Quorick Warwitch. It's like adding an extra little attack to each Warwitch turn, assuming you can keep the Archers alive. It's a nice but not overpowering boost. They would, of course, work similarly with other Raptorian Heroes we may someday get. I feared that the Beakface Archers would overshadow the existing Raptorian units and become the faction on their own. Their weak combat power and poor defenses against counterattacks (melee or ranged) keeps them from being any sort of bread and butter. They work well for early game positioning and as a fallback place for order markers, but they can't be counted on to take down an army on their own. I felt they worked well with the Sneaks, the Warwitch, and the Rogues. I vote Yea to induct the Beakface Archer into the SoV. Slinking behind the Beakface Archers are the Beakface Rogues, little assassins with mean blades. The most obvious comparison point is Darrak Ambershard, though actually I feel that comparison is tricky at best. Darrak's combination of more Life, Hide in Darkness, and tougher bonding buddies makes his Sneak Attack easier to pull off in some sense, though the Beakface's Evasive and its ability to go after his buddies instead of before makes its Sneak Attack easier to pull off in a different sense. At the very least, the much better basic attack on Darrak is worth quite a bit, as is the extended survivability. Does that match the price difference? Hard to say. The Darkprowl Thrall is another comparison point. Similar stats and anti-range defenses, bonding-like potential, and a potentially hard hit at the right time. The Darkprowl is a bit more expensive and has less defense, but its heavy hit is much easier to use. At the very least, the similar price makes sense. The Beakface Rogue is somewhat closer to the Beakface Sneaks than the Archer, and that makes thematic sense. One might wonder what the point of the Rogue is, in fact, given the existence of the Sneaks, but they work differently in a few ways. The figure is almost exactly the same as the figure for the Archer, except holding a different weapon and has a different color outfit. The visual difference between the bow and the sword is not as obvious as you'd think, though, and making the outfits green and red indicate a lack of awareness of colorblindness by the figure creators. It's somewhat of a pain for me to tell the two apart, but not enough for me to vote against. The Beakface Rogue is fairly derivative, and I like that. The design is reminiscent of the Beakface Sneaks in general feel with a Rogueish Sneak Attack. Without Flocking and with more reliance on Sneak Attack to do damage, these guys feel less all-out aggressive than the Sneaks with more of an emphasis on timed strikes. The Beakface Rogue seems like it should be easy enough to play: slink around and stab stuff. But I found it difficult, almost frustrating to use at first until I got a handle on how they really work. Here's the tricky part with these bird fellows: they are very reliant on their Sneak Attack. Their normal attack of 2 is just plain weak, and Defense 3 isn't going to hold up long in melee. A combination of Beakface Archers and Rogues seems like a good combination in concept, but in practice neither side stacks up. I mentioned in my previous review how the Archers don't have the offensive output to hold their own. It seems like the Rogues with their vicious Sneak Attack would make up the difference, but the requirement for Sneak Attack (having another figure adjacent to the enemy figure) is too strict to get often. Without that they don't do much damage, and they collapse quickly as a screen. Waiting for the enemy to get on top of the Archers (assuming the enemy is using melee) doesn't really work either, as that often just ends up with dead Archers. Mixing in a good screen, such as roborats, certainly helps the Rogues. Improved Flocking on the Beakface Archers allows enough order marker freedom to make good use of Sneak Attack, though positioning can be tricky with your own units in the way depending on the board layout. With this strategy, though, I found a Rogue Hero build with Nottingham Brigands to be more effective all around, with Beakface Rogues being a good addition to those ranks. Indeed, it is probably the best build for these birdfellows, though they often go down quick once they step up to strike. The most fun I had was a mix of Beakface Archers, Rogues, and Sneaks (though they aren't as competitive as a Brigand build). Early game Archers set the stage and position figures while getting off some potshots. The Sneaks then rush in to take down range opponents, and when things get hot for them follow up with some Archer shots and Sneak Attacks while there are still a couple of Sneaks in front. Mix in the Warwitch for a decent special attack. It's a little complicated to pull off, but each unit brings something different to the battle. Beakface Rogues look like a copy of the Beakface Sneaks at first glance, but their reliance on Sneak Attack makes them play quite differently. Mixing with some other Raptorians or Brigands for free positioning and/or turns allows them to strike at the best time, making the most of their potential. I vote Yea to induct the Beakface Rogue into the SoV. After playing with the Beakface Sneaks for the first time last week, I'm following these guys with interest. Although I'm slightly concerned about them being underpowered. They're not strong. Beakface Rogues are a pretty good value in a Brigand army, but die fairly easily. Beakface Archers can only improve in value as the faction expands.